If you’re eager for diesel power in your Q5, you’ll have to wait: Audi plans a hybrid Q5 sport-ute for 2011, and the oil-burner won’t arrive until after that gas-electric model. The 2009 Audi Q5 sports the sleek lines of a sweet German sedan, a date-worthy cabin, and good, hefty, but gimmicky handling. The 2009 Audi Q5 is the German automaker's first compact sport-utility vehicle, and it's a direct competitor to the Benz GLK, BMW X3, and Lexus RX crossovers. It's comes with a V-6 engine, all-wheel drive, and a six-speed automatic. The 2009 Audi Q5 provided to TheCarConnection.com for this Bottom Line road test summary carries a base price of $38,025, including destination, and an as-delivered price of $48,275. Even in its stylish class of luxury utes, the 2009 Audi Q5 is a handsome winner. 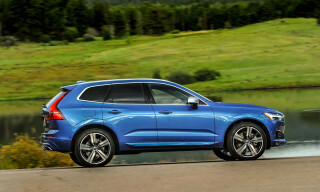 Like the Volvo XC60, its softly sculptured lines use height and stance to convey all the right SUV messages, the opposite of the angularity that the GLK and LR2 depend on for their more masculine looks. The Q5 is better looking than some sedans, in fact, except for the massive grille up front that's too large, too deep, and too everything. It's the same story inside, where Audi hashes out some sense from a slew of tiny buttons by framing them in wood, leather, and metallic trim, which gives the somewhat cluttered dash a unified, rich look. The Q5 teams a 3.2-liter V-6 with 270 hp to a 6-speed automatic, and all-wheel drive. The V-6 revs with gusto, even if it's louder and vibrates more than exepcted. Audi says we can expect to see turbodiesel and hybrid models in the near future, as well as a turbo-4 version. Ride and handling are a mixed bag. The Q5 wants to feel sporty, with its rear power bias (40:60). But like the A4, the Q5 usually has Drive Select, an electronically variable system that allows drivers to choose response levels for steering, braking, transmission shifts, and throttle quickness. We prefer a single well-developed suspension setting; with Drive Select the Q5 has heavy steering in all modes, and ride quality isn't supple enough to justify variable controls. The Q5 is good at moderately light off-roading, with its standard all-wheel drive, and 8 inches of ground clearance. Audi clearly meant it for all-weather traction, not seriously involved treks. Gas mileage is 18/23 mpg. Audi offers a roomy cabin and cargo hold for well-heeled buyers. As long as or longer overall than most of the competition, the Q5 is among the widest vehicles in its class and sports the longest wheelbase. That gives front seat passengers plenty of and shoulder and leg room, while headroom is average (but good enough for six-foot drivers and passengers). 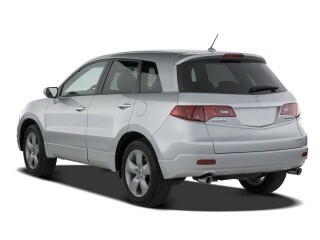 The front seats are firm and well-bolstered, while the comfortable second-row seats fold down for expanded cargo space. Audi molds in 1-liter-sized drink holders in door panels, in the console, and in the fold-down armrest in the backseat. 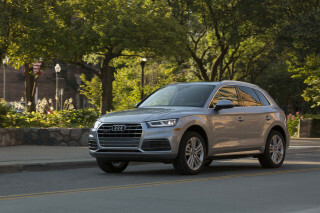 Safety features abound on the Q5; Audi's crossover also earns 5 stars from the NHTSA and top ratings from the IIHS, which calls it a Top Safety Pick. Audi makes parking sensors and a rearview camera options. For $38,025, the 2009 Audi Q5 hits showrooms with standard power features, automatic climate control, 18-inch wheels, satellite radio, wood trim, leather, heated power mirrors, and a tilt/telescope steering wheel. 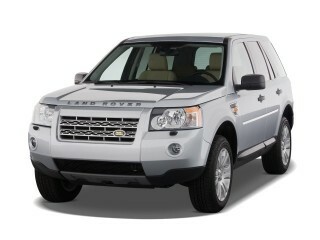 Options include a panoramic sunroof, power heated seats, a power tailgate, Bluetooth, and an iPhone/iPod interface. Top models offer navigation, parking sensors, and a DVD player. The 2009 Audi Q5 sets itself apart from blocky SUVs with a fast wagon roofline and a charming, chock-filled cabin. The Q5 looks good in a subtle way, even more so than some of Audi's sedans. It conveys all the right crossover messages without venturing too deeply into SUV caricature. Automobile says the Q5 is "very handsome" and even calls it "pretty," one with "exquisite detailing." Car and Driver says the Audi Q5 has arrived "fashionably late" to the SUV party. Motor Trend says its "dimensions are at or near top of class in every dimension except height." Edmunds calls the Q5 "stylish, luxurious and powerful." Audi has always done a good job dressing its cars' cockpits, in making sense of lots of switches and buttons. The Q5 has all of that, but its leather and wood and spare design give it a rich, unified look. ConsumerGuide says "Materials quality, design, and workmanship are top-notch." Automobile gushes, "[the] interior is beautifully rendered." Edmunds says the Q5 is "a couple inches longer than a BMW X3." The combination of six cylinders and quattro gives the 2009 Audi Q5 quick feet, but its driver-selectable handling is gimmicky. 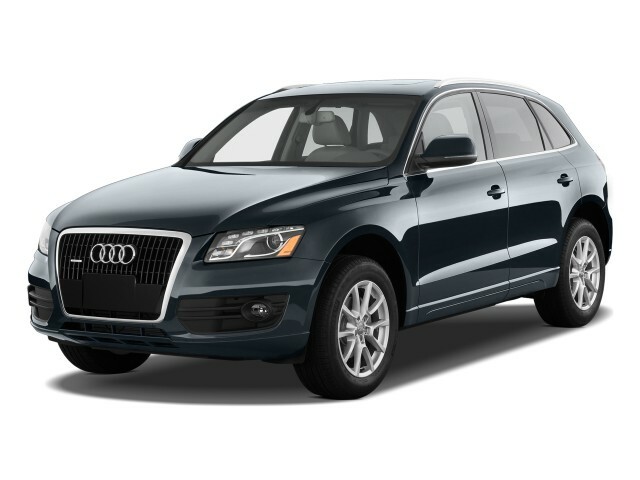 2009 Audi Q5s are available with a 3.2-liter V-6 teamed to a 6-speed automatic transmission. Edmunds says "this engine seems to lack any sort of personality." Car and Driver thinks it's "fairly sweet-revving," though noisier than expected, just like the latest Lexus RX. 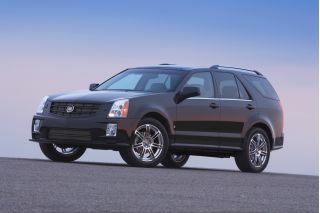 Motor Trend says it "revs freely and delivers its power in a cushioned lump." The Q5 posts a 0-60 mph time of 6.8 seconds. Many reviewers, however, lament that optional engines and transmissions will not (immediately) be offered in the United States. Car and Driver is "able to sample a Q5 with the 2.0-liter (that engine is, of course, available in Europe), and subjectively it felt every bit as quick as the V-6" Audi claims 0-to-62-mph times of 6.7 seconds for the V-6 and 7.2 seconds for the four." Automobile Magazine says of the V-6 engine, "Audi's upcoming S Tronic seven-speed dual-clutch gearbox performed brilliantly, with sharp off-the-line throttle response and crisp, rev-matching upshifts. Unfortunately, the S Tronic will not be offered in the U.S.-market Q5, at least initially, but our past experience with Audi's six-speed Tiptronic automatic, the sole U.S. Q5 transmission, has been largely favorable." Other reviewers also give positive reviews of the Audi 6-speed transmission. "You don't have to twist it hard," Edmunds says, "to get peak output." ConsumerGuide says "it delivers ample smooth, linear power." "Audi wanted excellent handling," Motor Trend writes, while ConsumerGuide says the "Q5 is fairly nimble" and that it "exhibits only minimal body lean." Drive Select sounds like gimmicky; however, Edmunds thinks "the difference in the way the Q5 behaves is immediately noticeable." Motor Trend says serious off-roaders need to know "the Q5 has a ground clearance of 7.87 in." Tidy packaging and high-quality finishes put the 2009 Audi Q5 near the top of its class for comfort, utility, and quality. The 2009 Q5 is a long vehicle offering a roomy cabin and cargo hold for well-heeled buyers. "Of all its competition," says Edmunds, the Q5's 110.5-inch wheelbase is the longest." It says that gives the Q5 better interior space of up to 101.5 cubic feet. Motor Trend says "size is largely responsible for its comfort." ConsumerGuide says the Q5 has "cushy, supportive front seats" and "tilting and sliding 60/40 rear seats." Car and Driver calls the driving position "commendable." Back-seat riders will find a split folding bench, as well as reclining backrest. The size of the vehicle also helps provide ample storage space. 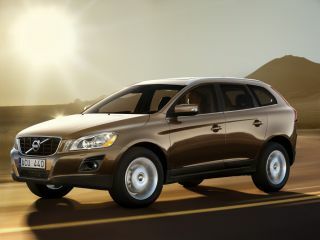 ConsumerGuide points out the "Q5 has a wide-mouthed hatch and fairly low floor to ease cargo loading." However, "small items storage is just OK."
The quality of the Q5 is standard Audi: impeccable. Edmunds says, "As always, the aesthetic experience is wonderful," that it sets "any Audi apart from the competition." The 2009 Audi Q5 ranks among the best SUVs for crash safety. The NHTSA gives the Q5 five stars overall, while the IIHS calls it a Top Safety Pick. "The field of view is commanding," says Edmunds, "obstructed by just its outside rearview mirrors." ConsumerGuide lists many safety features, and available safety options on the Q5. Bluetooth’s an option, but standard Sirius and available iPod connections give the 2009 Audi Q5 a state-of-the-art set of SUV features. For $38,025, the 2009 Audi Q5 has the usual long list of standard features. Automobile cites features like a new version of Audi's MMI, and finds it improved over prior versions. They note option packages that include "a power-operated tailgate," "keyless start," and "a blind-spot detection system." Motor Trend notes stand-alone options such as "the largest sunroof in class" and "a 505-watt Bang & Olufsen sound system with 14 speakers."